XR-5® geomembrane serves as floating cover for largest frozen french fry producer. 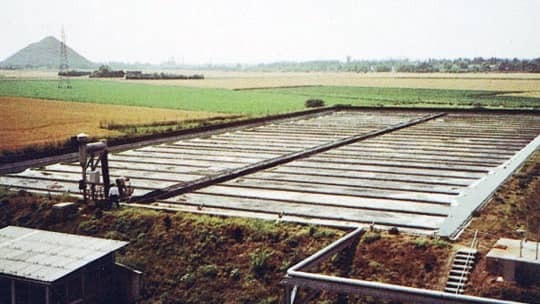 In 1981, McCain Foods, the world's largest frozen french fry producer, chose a bulk volume fermenter for waste treatment at its Harnes, France facility. The treatment system employs Anaerobic Digestion followed by nitrification. As the Anaerobic Digestion takes place, a bio-gas mixture of 50 to 55% methane is produced, captured by a floating cover, and delivered by blowers to the factory where it is blended with natural gas. The key to the system is the methane impermeable layer of XR-5® geomembrane which serves as the floating cover. The outside of the cover is constantly exposed to environmental conditions such as sun, wind, UV rays, precipitation, and temperature variations. The underside of the XR-5 cover is exposed to high concentrations of oils and grease, high liquid temperatures, varying ambient temperatures and constantly changing liquid levels. The strength and durability, low thermal expansion/contraction, chemical resistance, ease of installation, and resistance to UV rays were the primary reasons XR-5 was chosen for this demanding application. After witnessing the floating cover's ability to withstand some of the harshest conditions possible, McCain Foods has installed additional XR-5 systems around the world.